Blog.gears is an example of Blogger editor that uses Google Gears to make it work offline. You're able to create blog posts and edit one of the recent posts even if you don't have an Internet connection. As soon as you go back online, Blog.gears synchronizes the data stored offline with the data from Blogger's servers. There's nothing fancy about the editor (no rich-text editor, you can't add images or preview the post), but it's a cool preview of what we can expect from a new version of Blogger that will be offline-enabled. A more advanced blog editor that works offline and it's not restricted to Blogger is Windows Live Writer. "Writer synchronizes drafts on your blog with changes you make when you're offline, so you don't have to worry about reconciling different versions." Just in case someone doesn't want to install Windows Live Writer using Microsoft's all-in-one installer, here's a direct link to Windows Live Writer Beta 3 (4.55 MB, XP SP2/Vista). Some of this looks very good. Since I have over a thousand posts, and some of them VERY long, I look forward to hearing of other peoples test results (before I try it!). As far as I can tell though, there is still no way to do a complete local back-up of your blog. Google provides somewhat tedious process for doing such a thing, but hopefully some variation of this new feature will allow for a formal back-up procedure that will dump all your blog data into some standard XML or text format. This is not useful for backup. Check How to backup a Blogger blog and Tool for backing up a Blogger blog: both use Blogger's API, but the second solution automates the process. On a related note, I must confess that I couldn't access Blogger.com today (my proxy rejected cookies) and this tool allowed me to write some posts. It would be enough to link to the Donwload page, isn´t it? Yes, Stephan, I linked to Microsoft's page that has a download option (check the last paragraph). But you won't get Live Writer from that page: you get a tool similar to Google Pack's updater. From that tool, you can choose to install Windows Live Writer. I find this annoying, so I also posted a direct link. That's a bonus, not a replacement for the official download page. 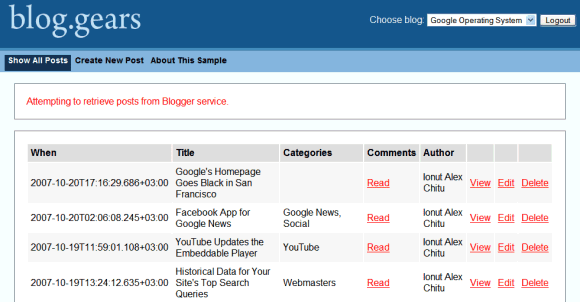 If you actually use blog.gears and find any bugs, please report them to http://groups.google.com/group/bloggerDev/. Thanks! I wonder if someone knows a linux based tool for offline blogging? I use scribefire but its really pain to add picture since it has no drag and drop capability. So if you have to create a tutorial which has atleast 10 screenshots, clicking on add image button and navigating to different picture each time is pain. Anyone knows a workaround for dragging and dropping pictures in blog? Thanks for the direct link Ionut Alex Chitu I dont want to update msn to the newest buggy version and the official link forces that.